The resort is located on the east side of the mountain and so receives a good amount of sunshine throughout the day. Méribel Centre is made-up of several areas, some offering direct access to the pistes, which are all linked by the free shuttle bus service. Mussillon : Located at the entrance to Meribel, this area is mainly made-up of individual chalets. A pretty and more intimate area, Mussillon offers access to Meribel Centre on foot and to the pistes using the free shuttle bus. Centre - La Chaudanne : With its shops, restaurants, bars, pubs, cinema, Tourist Office and Post Office, this is truly the heart of the resort. There is easy access on foot from the Centre to the Chaudanne, where you will find the ski lifts, ski school meeting points, Les Saturnins crèche (from 18 months to 3 years), the children’s club Les Piou-Piou (from 3 to 5 years) and the Parc Olympique (medical centre, swimming pool, gym, ice-rink, spa, climbing wall, bowling alley and night-club). You can find some private apartments in this area however the majority of accommodation is hotels and chalet apartments. 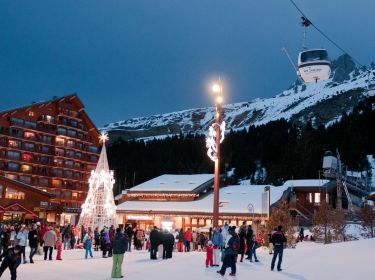 Le Plan du Moulin : Located close to the Centre on foot, you can use the free shuttle bus service to access the pistes. In this area you will find several residences made-up of privately rented apartments. La Renarde - Les Chalets : Situated just slightly above the centre of Méribel, this is an intimate and elegant area comprised of numerous private chalets, rented properties and 2 hotels. From most of the area you have direct access on foot to the piste which runs alongside and which takes you directly to the ski lifts at the Chaudanne. Morel - Altitude 1600 : These two areas are located on the road between Meribel Centre and the Altiport, and are mainly made-up of rented properties. In these areas there are several facilities including a supermarket, sports shops, bars, restaurants and a medical centre. The MOREL chairlift offers easy access to the pistes at the Altiport and a direct descent back to the area. For the residences which are slightly further away, you can take the free shuttle bus to either the Rond Point or La Chaudanne to access the pistes.